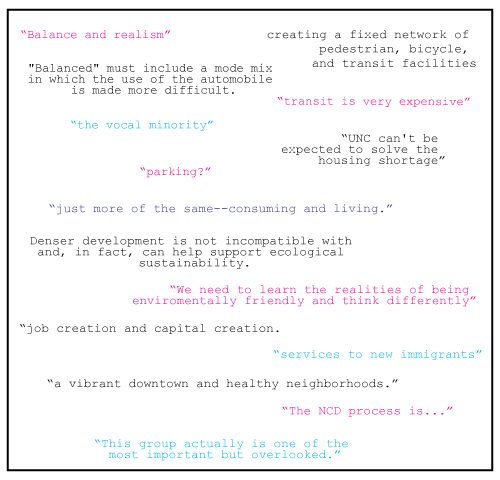 This image shows some of what people have said in the 2020 online survey about the Theme Groups. Download the PDF to see it all and keep the conversation going. Thanks for posting the responses, Garrett. I just read the PDF, but it was really frustrating to have one answer on each page. Putting them together along with the question being responded to would help and might make some of fragments (pages like “that the growth of the university is done in a way that supports the economic viability and development of a vibrant downtown and healthy neighborhoods.”) make more sense. Also, just putting the content in the body of a blog post would make it much more accessible than requiring the download of a PDF. I have to agree with the respondent that didn’t like the circle. I’d like to go back to the word clouds we had a few months ago. They told the story much better, in my opinion. It also might be helpful to sort out the content suggestions from the process suggestions, both of which are excellent. When is there going to be a survey that can engage folks who are new to the process as well? This one seemed targeted to getting feedback from folks who are already involved (asking about the process, instead of about the future). I’d like to see some surveys that are much simpler and shorter, maybe 3 questions that spark folks thinking about some of the decisions and priority-setting ahead, such as sprawl vs urbanization, redevelopment vs preservation, bikeways vs parking, big box vs local businesses, etc. People could respond on a scale indicating agreement/disagreement, and then allow an optional text field for comments. I think it would also be interesting to ask people what they are most excited about for the future of Chapel Hill, and what their biggest fears are.